Brice Ltd. offers creative solutions to meet any upholstery need; Our Manufacturer’s products cover the spectrum from quick & easy to custom & elaborate. A distinctive look, remarkable comfort and reliable construction have always been our standard: a variety of manufacturers, collections and programs make this possible. We leave the rest to your imagination. Explore the world of our Manufacturer’s designer collections. Their partnerships with innovative designers have resulted in collections rich in original work, sure to meet your fashionable needs. SHORT ON TIME? Explore the Quick Ship programs many of our Manufacturers offer which allows you to choose from in-stock, ready to ship options or customize frames with a wide selection of fabrics if you have slightly more time. 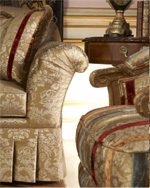 Ready to create some drama with your upholstery selections? Try adding decorative accents, such as a brush fringe or petite cord, or use a different nail trim finish option. Need a sofa for a more formal area of your home? Carefully consider the depth and height of your sofa. Higher seat height and shallower seat depth are perfect for visiting sofas and more formal areas. Envision lounging napping or watching tv on your sofa? Again, carefully consider the depth and height of your sofa. A lower seat height and deeper depth are more relaxed and casual. Perfect for that afternoon nap. Need a sofa that will stand up to heavy use? Durability is largely dependent upon the fabric selected; all of our Manufacturer’s frames will withstand years of continuous use. Our Manufacturers have a wide range of fabrics suitable for heavy use. Consider choosing a textured woven that will stand up to heavy traffic.